Having made a good impression on me with their EP The Frailty of Human Existence last year, 5 piece band Plague Mask, hailing from Syracuse/NY now present their new album Failure In Repetition. Although I obviously didn't yell my complaints about the shortness of last year’s EP loud enough (the new album is not very much longer - 5 songs and 18:19 min. ), I’m pretty happy with the mins and secs I am given. 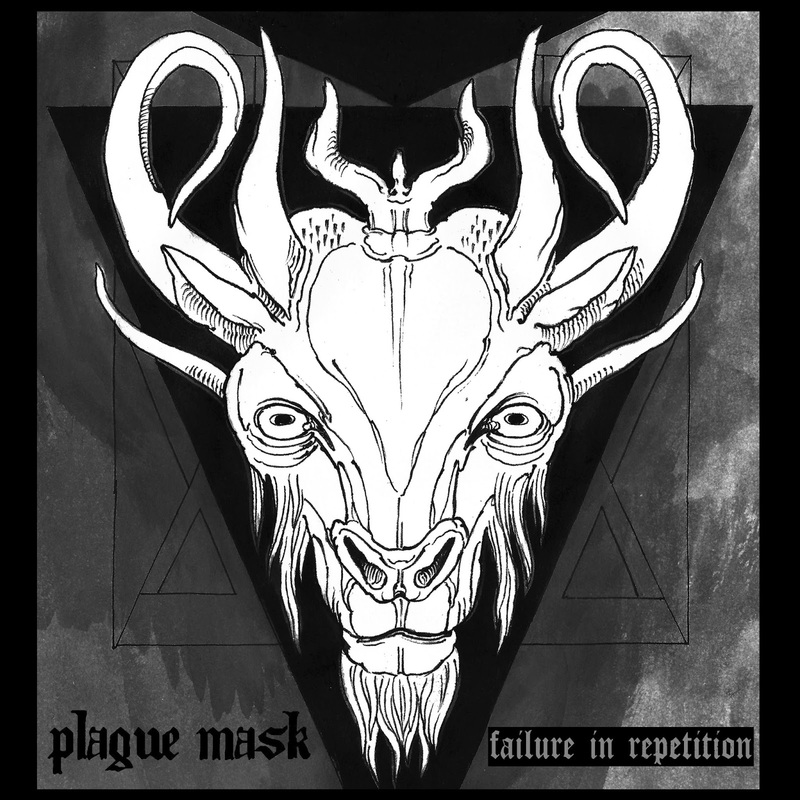 On Failure In Repetition Plague Mask manage to refine their already individual blend of black/crust/sludge/stoner/doom sound. They use all the reliable ingredients like before, but made everything less erratic in favor of a more constant, cohesive flow and a prevalence of a gluey, sticky viscosity… it’s sludgy to the core. The first and the last song are, like on the predecessor, a kind of “easy” intro with a long slow soft and acoustic sounding beginning, and an outro, beginning slow again, but more of the heavy kind of slow. The alluring and seductive melodies are even stronger and darker than ever before and have a lurking malice that turns mellow doom riffs into crushing within a second. Combined with the unusual qualities of the vocals, being demonically abrasive and snarly yet with a somehow mellifluous dark soft tone to it (falling even deeper in love with these vocals right now), a very special eerie and dangerous atmosphere emerges, where the soft darkness and the brutalizing harshness don’t oppose, don’t contrast, but entwine and entangle into a bittersweet “something” that makes Failure In Repetition really excellent and unique.